Even though I was back on firm ground, the world kept moving back-and-forth sideways like a ship for several more days. I caught myself holding on to the wall for support while peeing many times, but luckily never fell over. I was glad to have been to Antarctica, but I was also very glad to be back in South America. My next goal was to get quite a bit north as quickly as possible to catch up with my semi-plans which had gotten severely disturbed by my waiting around for the ship to Antarctica. So the same evening I arrived back in Ushuaia I got on a bus for Rio Grande, which is another Argentinian town on Tierra del Fuego, possibly the second least attractive place in the world, after Montevideo, but Montevideo has at least an attractive name to show for itself. 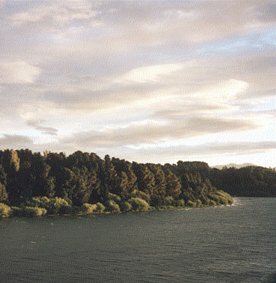 Rio Grande is on the east coast, it is very windy, and it is where the Falklands War was run from. For US$10 I got a bed in a two-bed room at Hotel Argentina, which is a really cozy hostel, with a big lounge, lava-hot showers and friendly owners. Together with Alix, from the ship, we celebrated our return from the sea by treating ourselves to a night at the movies, where they ran Naufrago, or "Cast Away" as you may know it. My Spanish had not exactly blossomed during the days on a Russian ship, so I was happy to watch a movie dubbed to Spanish which didn't really have too much conversation in it anyway. It turned out that just like ugly people may have beautiful insides, this ugly town had a beautiful inside in the shape of an excellent movie theatre. The fact that the tickets cost just about the same as one night's accommodation was justified by the high quality of the theatre. I gave them only four months to go bankrupt, though, as it seemed like none of the locals can afford to go here, we were practically alone. Early next morning I got up and had a good walk along the beach with Lynn, another friend from the ship. The road along the water is heavily embellished with memorials to the heroes from the Falklands War back in 1982. It's hard to tell from the praise that is given here that they actually lost the fight. Then again, in war there are no winners. A more cheery sight was the numerous dolphins that were playing out in the water, just a few meters from where we were walking. Lynn pointed at least ten different bird species out to me, but I only saw black birds, white birds, grey birds and grey-whitish birds. I'm more into people watching, I have to say. The only way to get away from Isla Grande Tierra del Fuego on this day was to go on a bus that took us all around the island before crossing over to the mainland again. This meant 7 hours in a bus to cover a distance of about 200km, going from Rio Grande to Puerto Espora via Porvenir. From Porvenir there is a 2,5 hours boat ride directly to Punta Arenas, but I wasn't sure it was running that day, so instead I stayed on the bus and suffered through a 250km bus ride on curving, bumpy roads. At least now I can say I've seen all of Fireland and pretty much speak the truth. It was my third arrival in Punta Arenas, and this time I slept at my fourth hostel in the city, "Backpakers Paradise". It's okay, cheap and fairly clean, but really crowded. I didn't do much here this time, I bought an airplane ticket to Puerto Montt for US$65, a heap of new films for my camera at the local duty free shopping mall that is the locals' reward for volunteering to live in this remote corner of the country, and watched "Gladiator" in blurry Spanish at the local technologically challenged cinema, Teatro Cervantes. I do not recommend it. I do, however, recommend the flight from Punta Arenas to Puerto Montt. It takes you along and over a magnificent part of the Andes, which if you have enough time of course can be better explored on the ground, or by the ferry line from Puerto Natales to Puerto Montt. The views from my window seat was excellent, reminding me very much of the scenery of my home country, Norway, snow-capped mountains, deep and winding fjords and pretty much no signs of human existence anywhere. Compared to the 45 hour bus ride through Argentina I think I made the right decision by choosing the 2 hour flight. Yet again I added a new bag to my travel sickness bag collection. This time the airline was Aero Continente, and I have to say they have chosen the right name. The toilet on the airplane certainly is best suited for people who are not suffering from incontinence, but are able to "hold their horses" until they reach ground again. Through just a few days of traveling, I had now moved from 65 degrees south to 42 degrees south, the equivalent of going from Iceland to Rome, or on another scale; from -6 degrees Celsius to 20 degrees Celsius, and the whole trip was transforming from a scenic one to a cultural one. Puerto Montt is the northernmost city in Chilean Patagonia, and the summer was ending here now on the last day of February. By the guestbook at the YHA/HI hostel I could tell the high season was definitely over; the last guest signed in (and left) almost two weeks ago. This meant I got a single room, for the first time in a month, and I was happy. When it's a single room, my experience is that it doesn't matter if everybody in it are snoring. The city has much to offer, but mainly attractions that I certainly did not expect to meet here. First, there was a KFC where I more than made up for the days of little nutrition onboard Mariya Yermolova. Second, for the first time in my life I went to an ice circus, "Rusio Sobre Hielo", which is a circus from Moscow running its whole performance in an ice-covered ring. It was slightly amateurish, being more "Bambi On Ice" than "Disney on Ice", if you catch my drift, but having earned my share of bruises from playing on the ice in a distant childhood, I could appreciate their efforts. Amazones in minimal costumes, tigers and bears were all sliding back and forth and around and around on the ice, to the deep fascination of all spectators. The crescendo of the show came through the part where we were presented to the story of Tarzan's life. I found it slightly surreal to see all these jungle animals and this next-to-naked man whizzing around on the ice wearing skates, but the female part of the audience seemed to think they were at a Chippendales show, so I had great fun watching them instead. Well worth the 6 dollars. The supposed main attraction in Puerto Montt is Angelmo, a very picturesque fishing port with nice wooden houses painted in a wide variety of colours. I decided to give it a try, and walked out there. Now, I am sure it's a nice place to visit in the main tourist season, but now it was just strenuous because of all the desperate seafood restaurants that really wanted to show me, apparently the only stranger they had seen for the last week, how good cooks they were. Bruised and battered I walked back to the city centre, where I discovered the real main attraction of the city; Museo Juan Pablo II. It's an "everything museum", where for half a dollar you get to enter a world where anything can be an attraction! 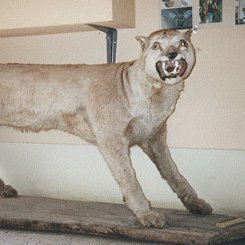 The world's least attractive stuffed puma, see picture to the right. It almost caused me problems, because I laughed quite loudly when I saw it, and when I took its picture a woman came over and asked whether I liked it, and it turned out she was the criminal behind this work of taxidermist art. I truthfully said I had never seen anything like it, and she seemed pleased by that. For my part, I have never seen such ill-treatment of an animal anywhere, and I have even been to the Kathmandu Zoo. In the section where they exhibit their proud collection of old German technological artifacts, the dominant piece is a telephone from 1898, and it is a beautiful one for sure. The only problem is that on the back it says "Aktieselskabet Elektrisk Bureau Kristiania", which means it was fabricated in my present hometown, Oslo, Norway. I didn't dare to tell them. In a small but nice plastic showcase a few pieces of concrete with yellow paint on them are shown. No, it is not from the Berlin Wall or something more ancient or of historical significance by normal standards. It's part of the runway on the old Puerto Montt airport where Pope John Paul II's plane made a landing in 1987 during his tour of South America. Now, there's a treasure for you! All this and much more is there to behold for anyone who prefer museums without a theme. From the ticket I could tell I was the second visitor that day. I didn't see the first one, he or she was probably being stuffed in the museum laboratory ("Rare Museum Visitor, captured February 2001") during my visit, for the pleasure of future exhibitions. The staff looked a bit bored. The city is located on four hills around a bay, hence its name, and I decided to go up to the highest of the hills to enjoy the view of the city and the bay. I almost made it, but almost there I was chased down again by a pack of Alsatian-poodle-dachses. It's amazing what species you get if you just let enough stray dogs roam your city. Having had enough city life for now, I decided to travel south to the island Chiloe, where rumours had it I would get to see lots of old buildings and churches and some even older people. I was bumped off the bus I wanted to go on, because it was full, and had to wait a while for the next one to leave, and then we were off for Ancud, the "capital" of Chiloe. It's not a very long journey, especially since it was broken into two parts by a ferry ride about midway, where several dolphins followed us and saw us arrive safely at the other side. A short ride after the ferry we caught up with the bus I could not get on; it was in a deep trench next to the road, 24 injured, 6 of them seriously. Sometimes fate is my friend. Those of us who made it to Ancud came to a very lively fishing village. Like in Puerto Montt, I was the only person staying at the US$10 hostel, so I spent little time there. Instead I just walked the town centre and the outskirts, which was just an endless walk through pleasure and relaxation. The houses were simple but nice, the people were smiling at me, the children were playing with laughter, the fishermen were lazily at work in the harbour, where the catch of the day had just arrived. The retired fishermen had come down to the boats to greet their youngsters, or more to the truth: To get their hands on the fresh shellfish and mussels, which they ate raw with great enthusiasm. They shared the leftovers with the pelicans and the seals who patroled the water around the boats with big, hungry eyes. The hills around the town were also a feast for my eyes, lush and lively in all shades of green. I quite liked it here. It had a very timeless feel to it, somehow. I was slighly bothered by being asked what the time was by almost everyone I met. As usual, I visited the town library, where I discovered that it had just been 90 years since they got the first clock here. Until then a man, someone who was considered to have a pretty good sense of time, was employed to hit a gong once an hour so that the others could keep track of what to call the meals they had throughout the day. Apparently there are none men trusted to perform this act any longer, so instead they ask strangers what the time is. Then the rain started. I walked to a cliff with a view straight westwards to the Pacific, sat down and waited patiently for the sunset. It never came. The clouds grew darker and darker, and in the end it was just dark around me, and it was totally pouring down. I walked back to the hostel, met a couple of Japanese backpackers who were slightly conscious after a 40 hour bus ride from somewhere in Argentina. Nothing much happens in Ancud after dark, so we just sat and watched TV. There was a flood warning for the Chiloe-Puerto Montt area, so I just went to bed, got up really early in the morning and got on the US$3,50 bus back to Puerto Montt, quickly transferred to the US$7,50 bus to Villarica, where I again changed buses and got to Pucon for US$0,60. Much better. Pucon, which isn't pronounced Puke-on, but Poo-con, is a very picturesque little village literally at the foot of the volcano Villarica. It's THE adventure holiday destination in Chile, with 4,000 mainly young inhabitants offering visitors all kinds of perils, from cliffhanging, rafting and volcano-climbing to hot springs bathing and Chilean food. For the first time on this trip I felt surrounded by Americans, and they all seemed to come from California. They come here to walk in the woods in a New Age kind of way, and when they're done with that, they walk further, to where the mud pools are, and worship Nature and the shiatsu masseurs/masseuses that can be found at various sites nearby. It's one of those places where Californians feel at home without being at home, I guess. Still, it's a nice place to visit. What attracted me most here was at first the black, volcanic beach, bordering the beautiful blue, too-cold-to-swim-in lake Villarica. With the excellent weather we had, I decided a day at the beach was called for, my first since Uruguay. I spent the day not getting a burn, just a tan, wondering about who decided to build this town, with all its wooden houses, just where the next lava stream will flow down from the volcano, whenever it will decide it is a suitable time to erupt. Pucon will no doubt continue to look very nice and cozy until that happens, and maybe it wouldn't help much to build the houses in concrete anyway. Drawing that conclusion, I walked to one of the adventure shops, and was immediately put on their afternoon whitewater rafting trip on the river Trancura. 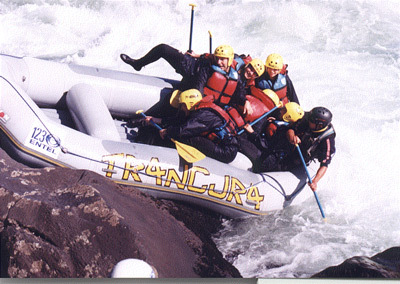 Trancura in the right season scores 4+ on the international rafting scale that goes from 1 to 5, which means that yes, it is in deed possible to leave this world while rafting on the Trancura. It was more than enough excitement for me. I started out with discovering I was the only non-Latino in the group, and somehow I must have agreed that all instruction were to take place in Spanish. Si, si. Before we actually got in the raft and the river, the instructor gave us a thorough lecture, I presume it had something to do with rafting, and possibly first-aid, insurance and quite possibly a bit about the after-life. I gathered this from the feminine, fearful squeals from the girls in the group and the manly, slightly nervous laughter from their Chilean boyfriends. "?Entiendo? ", he asked me in the end, "Si, si", I answered, "Muy peligroso, no?". From this he understood that I had understood. They didn't understand that my name was "Bjørn", though, so to them I was now "El Oso", which made them squeal and laugh even more. So there I was, on the Trancura Alto, wearing a helmet, a wet-suit and a life jacket, clinging on to an oar. Since I understood everything so well, the instructor let me sit in the front, which didn't mean too much anyway, since most of the time we would all be found in a big huddle wherever the raft decided we should be. I managed to stay out of the river for quite a while, and felt very confident when we suddenly approached a high waterfall. I was happy to find the instructor steering the raft towards land, but the joy was short. True, the river was just too wild to raft through here, but instead of walking past this point, the instructor pointed us to an 8 meter cliff next to the waterfall where he told us to jump off and meet him below. "Ha-ha-ha", we said, figuring he was joking about this cliff jumping thing. It turned out he was serious, and we survived, although the wet suits for some of us suddenly became not only devices to keep the water outside, it also kept some liquid inside, if you catch my drift. Having survived that, we did not fret too much about the minibus that was supposed to pick us up after the rafting, but seemed to have exploded instead. While we waited for the backup car I chatted with my co-suicidals, Juan, Jose, Joao and Marcela, who had never before seen a Norwegian, apparently. They refused to believe that anyone in their right mind would be comfortable staying at a US$10 hostel, so I guessed they might be some pretty well off Chileans. Anyway, we got on well, and when we returned to Pucon they dragged me back to their hotel appartments, for which they must have paid quite a lot more than ten dollars per night, judging by all the servants. The rest of the family was back at their hotel, I don't remember much except I was a bit surprised that the 3 months old baby daughter of Juan already had her ears pierced. Juan's wife, Carola, served up a light meal, and we all sat down and kind of had a conversation going. Everything went well until they of course asked me how I liked their country. By then I felt too ambitious to shoot off a simple "Bien", and instead went out on a long analytical speech, saying something like, well, in the first place Chilean families should not have more children than they can actually take well care of and give a decent education, so that the unemployment in the country may decline a bit, and second, people should stop smoking (all women I had seen so far were smokers) before cancer totally destroys what little there is of an economy in Chile, third, they should start realizing how corruption is a bad thing for a country, really, while paying your taxes is something everyone should do with a smile and fourth; they have to get rid of the all too obvious differences between people from the different classes in society, so that everyone can have as equal rights as possible. I'm not sure how much of this actually survived the translation into Bjørn-Spanish, but by the end of this speech everybody were just silent and looked at me in a funny way, so I guess they must have understood at least some of what I said. They understood that I meant it, anyway. Juan and Carola said they would have at least five children, and they would all be successful ones. I'm not sure whether that's a general Chile thing, or if it just applies to people visiting Pucon, where everyone you see are either newly married couples or families with five children or families with 1-4 children and a pregnant wife. "I think we will watch TV now", Juan said, and turned on the giant TV they of course had. The news started, but everything seemed to be about the new archbishop of Chile, so everybody continued talking about anything else than what I thought about Chile. When they asked me what religion I belong to, I almost told them I'm an agnostic, but, being one who learns from my mistakes, I instead just told them I belong to the Norwegian Lutheran church, and they accepted that. Luckily, right then the soccer news started, so the attention left me and my religion very quickly in favour of the Holy Leather Ball. Thus we remained friends, and they drove me to my hostel, where I had a shower and later joined them at the Pucon Casino. They lost quite a few thousand pesos, and I watched them, amused by finding a Las Vegas so far away from where I would expect it to be. All in all a good day in the Chilean vacation capital. My last day in Pucon I got up really early in the morning, well before the sun rose, and discovered that here the hills really ARE alive; The cap of volcano Villarica glowed a dark red in the dark, obviously up and getting ready to have visitors. That was a good thing, because going up there was exactly what I had planned for this day. I went with a group of 11 consisting of me, some Brits, some Germans, some Israelis and a French. Nobody mentioned any wars, so we avoided big trouble. Instead, we were transported by car to the starting point for the hike, at 1400 meters above sea level, and started walking in volcano gravel, a rather tiresome foundation for hiking. Just as we were about to complain at each other about the lack of good grip, it got worse; We entered hard snow-ice, our companion almost all the way to the top. I got really annoyed by walking in line with the group, whose members kept falling, sliding, cursing and yelling, and decided to lie to the guide that I too, actually, was a professional guide for glacier walks back in Norway. He probably understood what I meant, and told me I could find my own way up, as long as he could see me. That made a difference, I could speed up and enjoy the walk, soon breaking through the clouds that had formed, and entered a world pretty much like I expect Heaven to be like, with lots of sun, beautiful white clouds and a group of cursing devils below me. The view up there can only be compared to what you get from a window seat in airplanes sometimes. a few mountaintops peaking out of the clouds in the distance, and huge clouds moving endlessly towards nowhere. I arrived at the top, at 2800 meters above sea level, well before the others, and shared a bit of utter silence with the volcano. I tried to walk around the crater, but could only go a couple of hundred meters, hindered by a steady flow of highly sulphuric smoke rising from the volcano's edges, making it hard to breath and keep my eyes open to see anything. After 15 minutes of breathing poison I got a bit dizzy and decided enough was enough. Joining my group again, I found the Israelis whining about literally having gotten cold feet from wading through the snow. They kept nagging the guide to let them run down to the warmer climate below, but he wouldn't let them. After a while the Israelis became so annoying that I offered to run down with them, and the guide agreed to do so. So I gave them each a plastic bag from my backpack, and we slid down the side of the volcano really fast, until we hit rock and had to actually run. In the end we found ourselves all covered in volcanic sand, having gone from 1400 meters to 2800 meters and back in 4,5 hours. I felt really good, except I was breathing yellow smoke like a fairy tale dragon, and the guide just said "Descenso espectacular!" to me when he came down with the rest of the group. 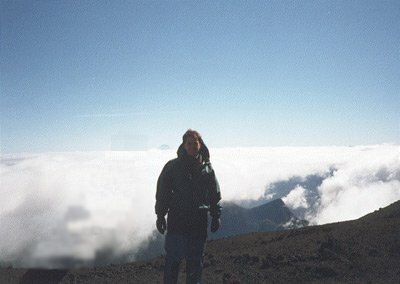 Climbing the Villarica is recommended by me! I also recommend, by the way, having a long, hot shower after such a dirty feat as rolling in heavy, sulphuric ashes is. Unfortunately, back at the hostel there was no water in the house, so I just had to change into semi-clean clothes and get on the bus to Santiago, smelling worse than your average public toilet. At least it was a night bus (US$15), so the other passengers could only smell me, not see me. I was in deed ready for the big city, Santiago de Chile.